I have a penchant for tiny things. I gotta take a moment here to gush and coo. Manly stoic types, avert your heads and stopper your ears. You have been forewarned. 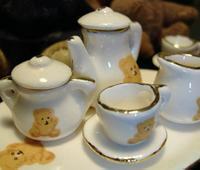 Isn't this just the cutest little tea set? Can I get an "awwww"? Somebody gave me this many years ago to add to the massive teddy bear collection I had at the time. I've since reduced the bear population to just a few of the smallest ones, due to space constraints and hubs complaints. But bears are still some of my favorite people. As you can hopefully tell, the tea set is tiny enough that my little friends can enjoy the comfort of tea, just their size. The teapot is only an inch tall. 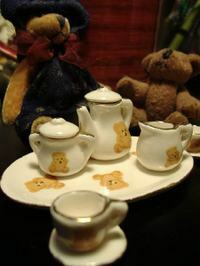 See, I've been bringing out my tiny teddies to arrange them for Christmas. They've got their own little decorated tree and wrapped presents and everything. Oh, come on. We need another "awwwww" here. I know, I know, it's just too Mrs. Butterworth's. I'm sure this fascination I have with miniatures isn't that unusual. I don't KNOW any other adults that collect little tiny things and set them out like a child's playhouse, but I'm sure there MUST be some other folx out there like me. Who else buys all that dollhouse furniture in the craft store? Surely that can't ALL be for kids? Ok, only one more teeny tiny cutesy thing, and I'll be done. 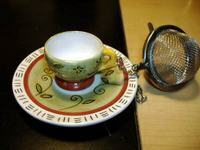 This little tea ball w/ cup and saucer was in some of my mom's things that my aunt brought me. It was in a bag with a bunch of cake decorating stuff, which apparently my mom was planning to learn how to do before she got sick and left us. I'm not sure I have the cahonies to try cake decorating yet. But the tea ball I've used quite a lot. Isn't it just the cutest thing? It's only about 2 inches across. The cup is attached to the ball by a little chain. When you're done steeping your tea, you can set the ball on the cup and saucer. I don't know why this tickles my fancy so much, but it does. Unfortunately, the tea ball is metal - wire mesh - but I don't care, I still think it's just the cutest thing in a single-serving tea ball. Ok, I'm done. We now return you to your regularly sized program. I share your sense of charm with small things. Particularly small ceramic tea sets! So no, you're not the only adult with this foible.